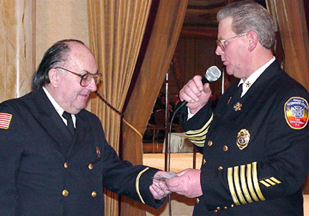 The Hasbrouck Heights Fire Department held their installation dinner for Fire Chief Robert Thomasey at The Venetian on February 1, 2003. 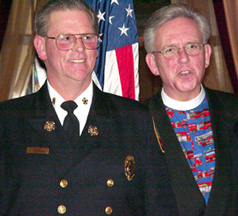 The program included benediction and talk by Fire Department Chaplain Joe Pickard. Speakers included Fire Commissioner Justin DiPisa, Deputy Fire Commissioner Andrew Link, Mayor William J. Torre and Fire Chief Robert Thomasey. Other Boro officials attending included: former Fire Commissioner Garrett Pepe, Councilman John Wassberg, Boro Administrator Michael Kronyak and Boro Clerk Rose Marie Sees. 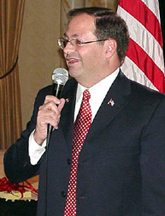 Citations were given by Assemblywoman Rose Marie Heck. 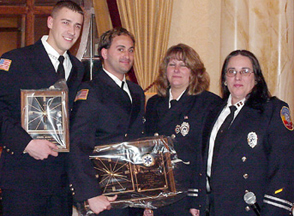 The Mutual Aid Fire Chiefs representing Wood-Ridge, Wallington, Little Ferry, Carlstadt, Moonachie and Lodi made presentations. Other dignitaries attending included the Mutual Aid Zone II Coordinators, and The Hackensack Fire Department Deputy Chief of Operations. Recognition was given to the immediate past Fire Chief Arthur Knobloch, and to the various department personnel to include: presentation of ex-officer badges, certificates for the top EMS responders, etc. Roses were given to the Chiefs' wives. 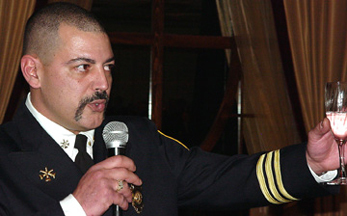 Master of Ceremonies was former Fire Chief Tony Greco. 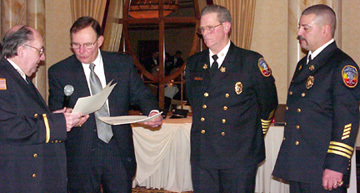 Chief Robert Thomasey, Deputy Fire Commissioner Andrew Link and Mayor William J. Torre.